So, just by chance, my husband and his parents were working at the OUR Center today, and Elaine Klotz, who does all the fundraising for the center for feeding folks was there. And she had all the bowls for the auction in her office. Kinda did it by guess and by golly and if you look at the previous picture where it's just dry... you'll notice it's very different now that it's actually fired. Peers at it with bemusement. Even the leaves look cooler, because they show all the brush lines now. I really love how the butterflies turned out as well. You can click either picture and it'll take you to where the butterflies and flowers on the outside of the bowl show up. I love my in-laws. This morning, they went with John to the OUR center in order to just wander about town, see the library and stuff in order to give me time alone with my computer. *laughs* They are so very cool. Truly, I admire your artistic talents. *smiles* Thank you, very much! Thank you!! I am really happy with how it turned out as well. Whew. I absolutely love the iris bowl. Ohh it turned out so well! Whoever gets this bowl is getting a lovely piece of art. that is gorgeous. 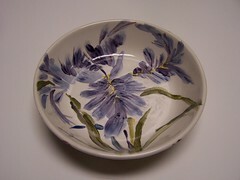 Glazes are really hard to work with for that very reason, they dry so far off from what they fire. I've never been very good with it, then again I only got to dabble with it a little bit in high school. I am impressed with how well that turned out. It looks like it all came out pretty smooth when it was fired, was there a second layer of clear fired over the color? Usually clear is blue and your dry bowl doesn't look like it has that. I have some pieces that I want to try that with (we have a kiln) but I'm not 100% sure how that works. 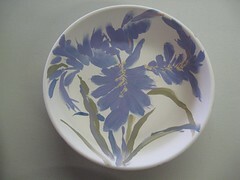 Do you know what cone the glazes you used were? ... and, yeah, they put a coat of clear over the painted colors in order to keep the items food-safe. It's a relatively low temp firing process, as it's cheaper, and there are more bright colors available at the lower cones. That turned out quite lovely -- rich colours and great detail! *smiles* Thank you! They'd given us a palette of just six colors. Most years it's all primaries and brights. For some reason they gave us olive and gold and blue and lavender and burgundy and a deeper orange gold, so I was kind of reaching with this one, but the blended colors did much better than I'd hoped. The bowl turned out beautifully! It did! It did! I'm bemused and happy about that. And all the detailing that I thought got lost when I put it on, all stayed on there and showed through with the firing! I'm pleased. You are a beautiful artist sweetie. The bowl is just gorgeous. It's amazing how different if turned out after the fire. Wow! The lady in charge has it exactly right!